With 2018 being the Bicentennial of Illinois, it's an ideal time for us to look into our past. Our first local institution of higher learning was McDonough College, which opened its doors in 1837, just six years after Macomb was laid out. WIU doesn't have a history that reaches back to pioneer times, although it is 119 years old. Even so, it has a fascinating history, which deserves to be remembered and appreciated. At the time Western was chartered, Illinois did not need another state-supported teacher-training institution. It already had several in Bloomington, Carbondale, Charleston and DeKalb. However, it didn't have one focused on the needs of the people of western Illinois. In those days students attended schools in their hometowns or nearby. In "First Century," John Hallwas '67 MA '68 said, "The effort to establish one in that part of the state originated in Macomb, chiefly because local leaders felt their community would be chosen as the location." On April 24, 1899, the state legislature passed the bill that provided for the establishment of a Western Illinois State Normal School. That bill, most likely written by Macomb lawyer J. C. Thompson, stated in part, "The object of the said Western Illinois State Normal School shall be to qualify teachers for the common schools of this state by imparting instruction in the art of teaching in all branches of study which pertain to a common school education, and such other studies as the board of trustees may from time to time prescribe." It was this statement that attracted the attention of the legislators and ensured they would react positively. In those days, teachers in the common schools, who taught grades one through eight, dealt with tremendous disadvantages. They performed their work in settings that were frequently overcrowded, in poor repair and ill equipped. They oftentimes found themselves staying up well into the night to prepare lessons and grade papers for students in all eight grades. And, in some cases, they were called upon to cope with unruly students near their own age and larger in stature than they were. The quality of public school teaching in Illinois at the turn of the century was deplorable. Commonly, students graduated from the eighth grade in the spring and took up teaching the following fall. 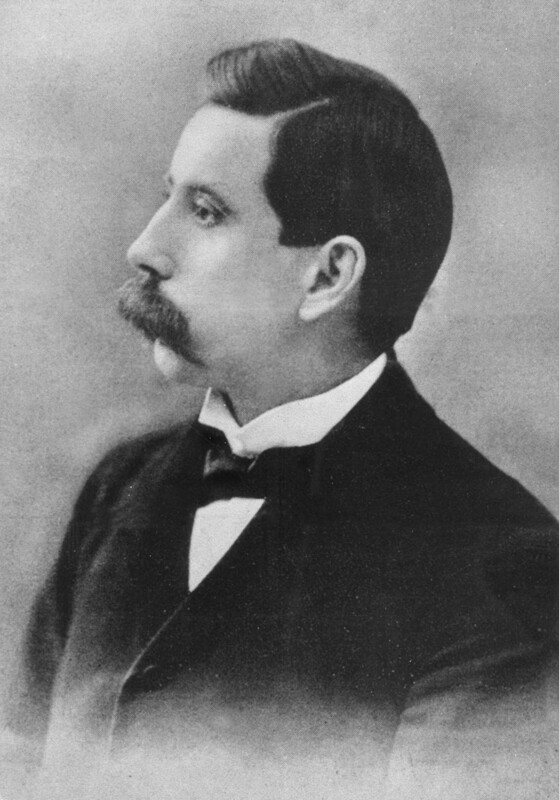 At the turn of the past century, Alfred E. Bayliss was the state superintendent of public instruction. Well educated, highly experienced and in touch with top educators throughout the nation, he approved of the unique mission of the institution and made his opinion known. The bill creating Western avoided naming a particular site for the school but instead stated that the board of trustees should arrange to receive proposals for the donation of a suitable location and other valuable considerations and should select a place that was as near the center of the Military Tract as possible, which was an area in western Illinois roughly from Rock Island County to Calhoun County and between the Illinois and Mississippi rivers. Towns competing for the new normal school were Aledo, LaHarpe, Macomb, Monmouth, Oquawka, Quincy and Rushville. After examining the potential locations and the financial inducements offered by each town, the board voted—597 times. Each trustee was a regional resident and naturally was committed to the site nearest his home. Finally, Governor John Tanner countered the deadlock by appointing a board composed of members from outside the region. On August 14, 1900, after hearing a convincing argument by Illinois General Assembly leader and Speaker of the House L. Y. Sherman, the new board chose Macomb. Macomb was nearly dead center in the Military Tract. Also, it had offered a site with 30 acres (soon to be enlarged to 60 acres), located a mile northeast of the square on a hilltop in the gently rolling countryside, previously the site of the Henry Chase brickyard. In addition to providing the site, valued at $8,958, the city offered the state $70,000 and agreed to clear the old brickyard grounds; lay pavement from Lafayette Street; create sidewalks to campus and provide sewer, water, gas and electricity to the site. Town leaders realized the positive impact the school could have on Macomb and the surrounding area. According to "Macomb Journal" editor W. H. Hainline, when the telegraph message arrived from Springfield, saying, "Macomb won on the first ballot," pandemonium broke loose, despite the late hour (10 p.m.): "The cannon was fired, bells were rung, whistles were blown, and everyone within miles knew that the normal school had been located in Macomb." The board of trustees immediately set about choosing a president for the new school. The state superintendent of public instruction, Alfred E. Bayliss, wanted the position and he had Sherman's support, but on Oct. 18, at a meeting in Chicago, the trustees selected John W. Henninger, who was Bayliss's assistant. Political leader Richard Yates, who would soon be governor, had favored Henninger, who was from his home town of Jacksonville, and he had swayed the board. 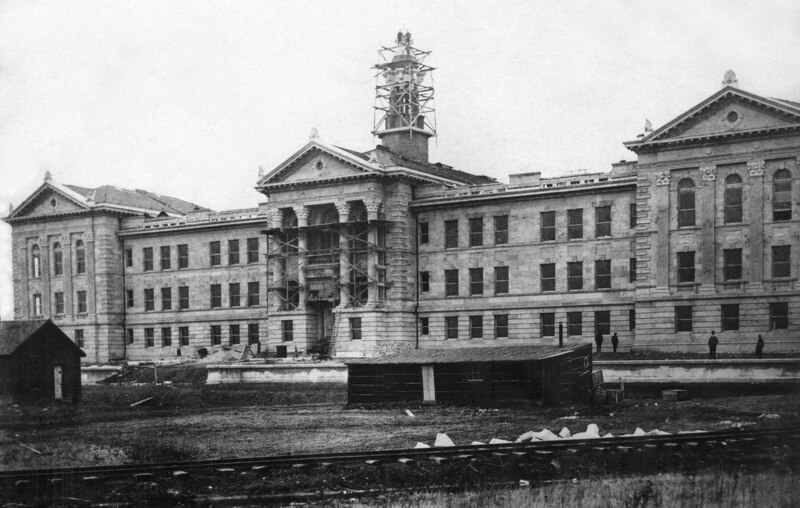 Construction on the normal school building, later called Sherman Hall, began during the first week of November 1900, and on Dec. 21, the cornerstone was laid. The day before, the "Macomb Journal" published a detailed description of the event, including the parade that would be held. In late morning on Dec. 21, Governor Tanner arrived by train and met with local officials at the Chandler Hotel. At 2 p.m., his carriage and those of other dignitaries followed marching militia groups from Galesburg, Quincy and Peoria, as well as a military band from Canton, in the long parade to the school site. Several thousand people turned out on the cloudy, chilly day to watch the cornerstone be put into place and to listen to speeches by Board of Trustees President Charles J. Searle and the governor. The following day, Hainline devoted the entire front page of the newspaper to the cornerstone ceremony and the school. While the Western Illinois State Normal School building was being constructed, President Henninger supervised the purchase of materials and assembled a faculty. Henninger hired nine teachers for the normal school, a librarian and three critic teachers for the teacher training school. Creating the campus was a gradual process. The day Western finally opened, Monday, Sept. 23, 1902, the exterior of the main building was completed and the layout of the interior was apparent, even though construction was still underway on all of the floors. As one early student recalled years later, "Through one long, weary session we sat beneath interminable pounding; our teachers were under necessity of shouting if they wished to be heard; our heads buzzed from continual confusion ..."
The terraced lawn in front of the building was made with earth from the excavation, but it had no shrubs or flowers, nor did any other part of the grounds. Rather, it was composed of rutted bare earth. There were no driveways, and the only sidewalk was made of planks. As "First Century" tells us, "The landscape was designed by Thomas Hawkes of Chicago, and while the building was under construction, shrubbery plans were developed by Chase Brothers and Company of Rochester, NY. Professor John Van Ness Standish of Galesburg, a multi-talented educator who was the former president of Lombard College and a noted horticulturist, selected most of the trees. From 1903-05, he supervised the planting of 500 trees of various kinds, as well as many shrubs. In the spring of 1903, biology teacher Homer Roberts developed vegetable and flower gardens to provide his students with experience cultivating and making observations related to plants. 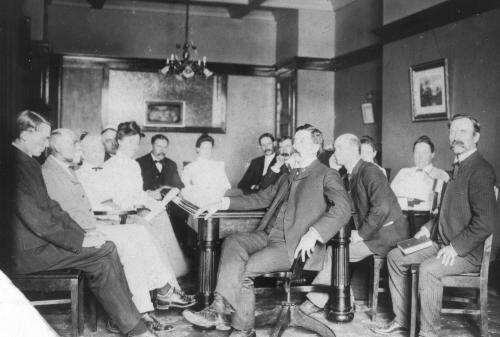 During Western's early years, there were many fine teachers and administrators associated with the school, who can be credited with setting the course. One of those was James C. Burns, who was assigned the job of recruiting and registering students, in addition to teaching his classes. He also brought the first minority students to Western in 1905—six Philippine students. At that time, a number of American colleges and universities were taking similar action in an effort to provide deserving young people from the war-torn Philippine Islands with much-needed higher education. All six of those who came to Western were good students. The most outstanding, however, was Camilo Osias, who distinguished the school as a result of his outstanding performance in oratorical competitions and who, back in his own country became a beloved and eventually famous leader in the fields of education and politics. The first English teacher at Western was Samuel Hursh. Like several other early teachers, Hursh pursued his education as circumstances permitted. He was born on a farm in 1848 in Welsh Run, Pennsylvania. His father had died in 1853, and because Hursh's older brothers were out West or in the war, he took charge of the family farm at the age of 14. He came to Illinois with his mother in 1866 and worked in the blacksmith shop of his brother-in-law at Lanark for four years. In 1870, at the age of 21, he attended a rural school in order to complete his eighth grade education. He then taught in Shannon and Spring Valley for some years, while attending Illinois State Normal School. With his degree, Hursh was soon hired to teach and serve as principal at Mt. Carroll. After five years there, he led schools at Woodstock, Mt. Sterling, and Streator. Then, in 1902, he was hired to create the English program and teach at Western Illinois State Normal School. "Daddy" Hursh was loved by Western students. He was also much focused on their inner growth, as the underlying purpose of their studies. During the 1905-06 academic year, he served as acting president. Another member of the original faculty at Western was Cora Hamilton. Born in Connecticut in 1861, Cora did not attend school until she was 8 years old, chiefly because her family moved around so much. However, her father, a mechanical engineer, was committed to education, so she was taught to read at home and, as she later recalled, "she was raised in a background of worship for learning." During the late 1860s, her family moved to Galesburg, where Cora attended both grade school and high school. In 1878, she acquired a teaching certificate and soon taught in a country school near Chatsworth. Before coming to Western in 1902, she taught teaching methods at Pontiac High School and also became a primary school supervisor, first in Joliet and then in Bloomington. At Western, she was the first principal of the training school, and as such, she developed the school's course of study. After Western opened, she supervised and coached many would-be teachers over the years, becoming the most beloved member of the early faculty. In July, 1905, John Henninger resigned and Alfred Bayliss was offered the presidency of the Western Illinois State Normal School. Bayliss achieved much, including raising the caliber of the faculty, initiating a summer term of study, and establishing a Model Country School, on West Adams Street, which brought Western national attention. Unfortunately, the promising administration of Alfred Bayliss came to a premature end when the educator was killed in a horseback riding accident at his farm in Iowa during the summer of 1911. In September of that year, the Board of Trustees promoted John McGilvrey from supervisor of the training school to acting president. In March, 1912, he hired Walter P. Morgan to fill the post he had vacated. A few months later, on June 17, 1912, Morgan was selected as Western's third president. Morgan proved to be a talented administrator, bringing national attention to Western. From 1926-1928 he served as secretary-treasurer of the American Association of Teacher's Colleges, which ranked its 145 member institutions, so he knew exactly what a good teacher's college should be and how to represent it to examiners from the outside. It's not surprising, then, that in 1928 Western ranked among the top 20 of those schools. In that same year Morgan was elected president of the organization—an honor that reflected enormous credit on Western. The next year he was elected president of the North Central Association of Secondary Schools and Colleges, an influential accrediting organization. In 1930, President Hoover appointed him to an educational board of consultants within the Department of the Interior, which conducted a nationwide study of teacher training at the onset of the Depression. In addition, Morgan directed the growth of Western from a two-year teacher training school with a limited focus and curriculum to a four-year teacher training college, offering for the first time the opportunity to major in specific areas of academic interest. In 1927 Western had 666 students enrolled in its college-level program and 210 in its training school. Western had dealt with the challenges presented by World War I and emerged with the broadened focus that would enable it to prepare young people for life in an increasingly complex modern world. Of course, this paved the way for even greater changes, in the 1950s and 1960s, as Western became a multi-faceted university with thousands of students.